Bexley, Kent, UK. 23rd April 2014. Well, here I am writing the first post to my blog, a little under 24 hours before I board the ferry for France. By tomorrow afternoon I should be in Ypres, the first stop on my journey to Russia and beyond. So who am I? My name is Geoff Keys, I’m 62 years old and am starting a motorcycle journey that will ultimately take me several years and to all seven continents. My plan for the first year is to travel across Europe to Russia, visiting Kazakhstan and Mongolia as I head east to Vladivostock. A short ferry ride will take me to Japan and South Korea and a much longer plane journey will take me, and Doris, my Suzuki DR350SEX, to New Zealand and Australia. No firm plans have been made beyond that. In fact the only firm plan as I write this is a booking on a ferry to France and a hotel in Ypres for Wednesday night. After that everything is uncommitted and unknown, surely the best way to start an adventure. Why undertake such a journey on a motorcycle? Those of you who know me won’t need an answer to that question – there simply isn’t any other way that I would contemplate. But if you’re a casual passer by it’s worth considering the advantages of a motorbike to the traveller. Briefly, it’s got an engine so no strain on my 62 year old muscles, you’re not isolated from those around you, it has luggage carrying capacity, you’re completely independent of timetables, you’re in the fresh air (yes, and rain) and it’s just simply the most sustained fun a human being can have. You may want to disagree but you’ll struggle to convince me otherwise. My apologies for not having set up this blog sooner nor making it look pretty, but all that will follow in due course. This short introduction at least gets the ball rolling – more to follow soon. Good luck Geoff! Looking forward to reading all the updates! Ditto what Jon said! Be safe be happy. 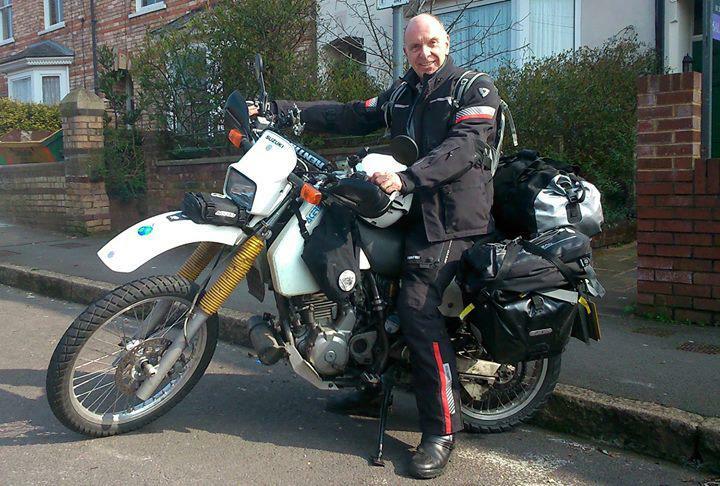 good luck geoff,and as a keen motorcyclist for 36 years,no you dont need to explain why your doing it ,i would love to undertake such a journey,remember to catch up if/when you come to nelson nz. Geoff, you look the part if nothing else!! All the best in your travels and we’ll see you in Canada at some point. Glad to have ridden a tiny part of your journey with you Geoff. Look forward to your updates. Keep safe mate, have fun. Wow Gerry, what bad luck. Until I read this I was picturing you heading south into ever warmer climes and envying you. Not any more! It’s so easy to get caught out on those hairpins and you were very unlucky to pick up those injuries. I hope you get better very soon and I think you should get yourself and the bike back in shape and give it another go. Get well soon mate, I’ll be thinking of you.